Wood bricks (also known as compressed wood bricks) give you the same cozy heat and cheerful ambiance from your wood stove – with a green bonus! Made of kiln-dried, super-condensed wood chips and sawdust, bricks can be burned by themselves or with cordwood to produce clean-burning, long-lasting heat – at a better price than cordwood. Save money: Wood bricks burn hotter and longer than cordwood, which means you’re getting more heat for your money! Save space: One pallet of wood bricks gives you the same heat as about a cord of wood – but takes up only about a third of the space. Save your back: Don’t bother hauling, chopping, and stacking cordwood – we deliver neat pallets of pre-stacked, weather-protected wood bricks. Save the environment: Wood bricks are made from clean, recycled wood chips and sawdust, and they produce fewer carbon emissions and none of the creosote of cord wood. 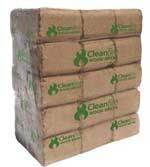 Save your home from pests: Wood bricks are shrink-wrapped and shrouded to protect them from the weather and from bugs, mice, and other critters that can get into cord wood piles. Wood bricks are hot, hot, hot! Because they are dried to less than 10% moisture and compressed to a density similar to that of wood pellets, a wood brick produces much more heat than a log. Typically, you should use about half the number of bricks as the number of cordwood logs you would normally use. 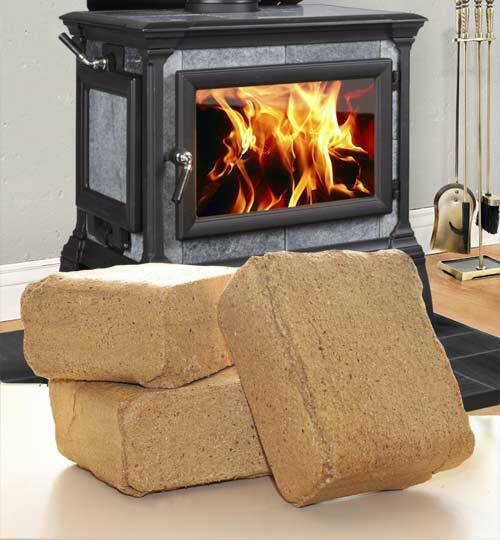 Do not overload your wood stove with wood bricks – or you risk overheating your stove! Check your stove manufacturer’s recommendations for your stove’s maximum heat capacity. Our customer service manager has a large woodstove that heats her whole house. She makes a teepee with three bricks and starts the fire with crumpled newspaper underneath. Once the bricks are enflamed she lays the bricks in front pushing the teepee towards the back of the stove. To fill the stove she then stacks bricks in a layer fashion two to three levels high. This method allows for a slow steady fire back to front, with one more restack after work to make it through the night. Joy, our lead customer service rep, burns both bricks and cordwood in her woodstove. She places 5 to 6 bricks across her stove with newspaper / kindling in between, and stacks cordwood on top. She loads her stove half as often as when she used cord wood only, and she keeps her family nice and toasty! One pallet of wood bricks produces the same heat and burn hours as about a cord of seasoned wood. If you typically use two cords of seasoned wood at $300 a cord, you could replace half of your wood with bricks, and save almost $200!